Jamaica: 1938-52 £1 chocolate and violet, hand-drawn essay. 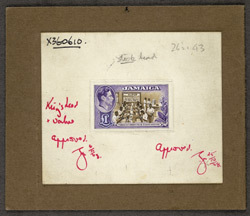 bl.uk > Online Gallery Home	> Online exhibitions	> Philatelic rarities	> Jamaica: 1938-52 £1 chocolate and violet, hand-drawn essay. Printer: Waterlow & Sons Ltd. The £1 stamp issued in the reign of King George VI shows Tobacco Growing and Cigar Making. Shown is the fine original essay showing the portrait of The King. The first £1 stamp for the reign of Queen Elizabeth II was to have been in the same design and colours but this was abandoned after they were printed.